I love to read. I have for as long as I can remember. I have distinctly fond memories of the library and the book sales from as far back as elementary school. I would lose myself in books, and I’ve always been someone who returns to her favorite books again and again — I don’t feel like just because “I’ve read that” that I can’t read it again. Reading is one of my favorite things to do when I’m not doing anything — on vacation, by the pool, on a trip, late at night. Since I’ve had kids, though, I’ve found it hard to read. There aren’t enough hours in the day to do the things I have to do, much less the things I’d like to do. When each of the boys were little, I never read because I couldn’t manage to hold a baby (even a sleeping one) and a book at the same, and when I didn’t have to hold a baby, I needed to be asleep. As the boys have gotten a little bigger, I’ve gotten busier, and I also have the problem that any flat surface that I leave a book on leaves it vulnerable to being grabbed and torn by my little ones. As such, I don’t read much, even though I love it. Since being in Vienna, I’ve started to go out on my own for a few hours a week, and I almost always read during that time, but that’s pretty much it . . . until I starting using the Kindle app on my iPhone. It’s letting me read all the time — when I’m putting Liam to bed, on the train going to pick Benjamin up from school, while the boys are napping. Wherever I am, I always have my phone, and that means I always have my book. The app keeps track of my place, so even if I only have a few minutes, I can easily read a few pages. I love it. I’ve read more books in the past 3 weeks than I have in the past 3 years. I just have to be careful that I don’t keep myself up late at night “just to finish the chapter” (which is a problem I’ve had since I was about 7). Coincidentally, I’m not the only one in my house currently discovering the joys of reading. Since B was about 1, we’ve had story time every night in our house. We typically read 1 story to both boys, and then Liam goes off to bed (he only has the patience for 1 so far) while we read another 3 (or so) to Benjamin. But lately, B has started “reading” to us. 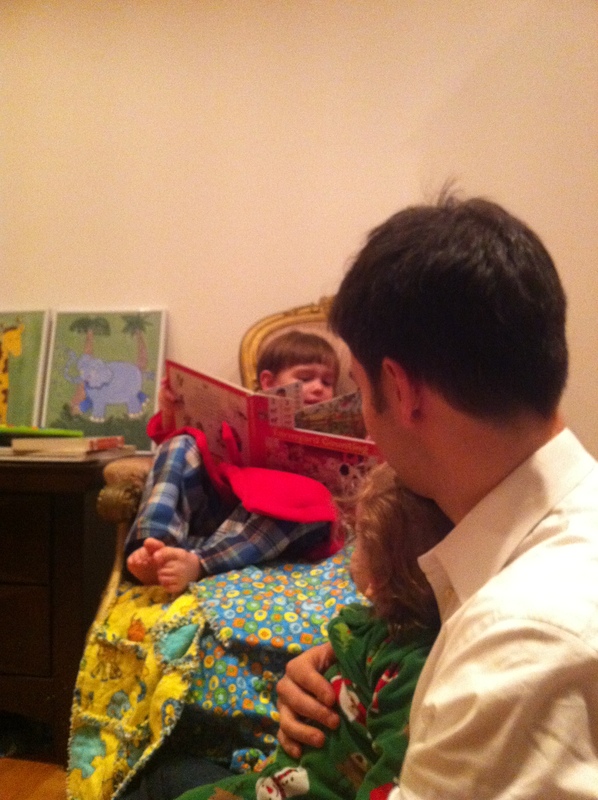 He’s not actually reading yet, but he has several of his favorite stories memorized, and he loves to read them to us. Every so often he gets stuck, and if I try to help him (even if he requests the help) I suddenly find a hand over my mouth. He really wants to do it on his own. I’m amazed at the amount of detail he remembers from the stories — if you didn’t know he wasn’t reading, you wouldn’t be able to tell. This entry was posted in Adventure in Vienna, Kids and Parenting and tagged books, reading by admin. Bookmark the permalink.